Former cohost of The Chew and a Top Chef All-Stars Fan Favorite, Carla Hall serves up more than 100 fantastic recipes for twists on classic comfort food. 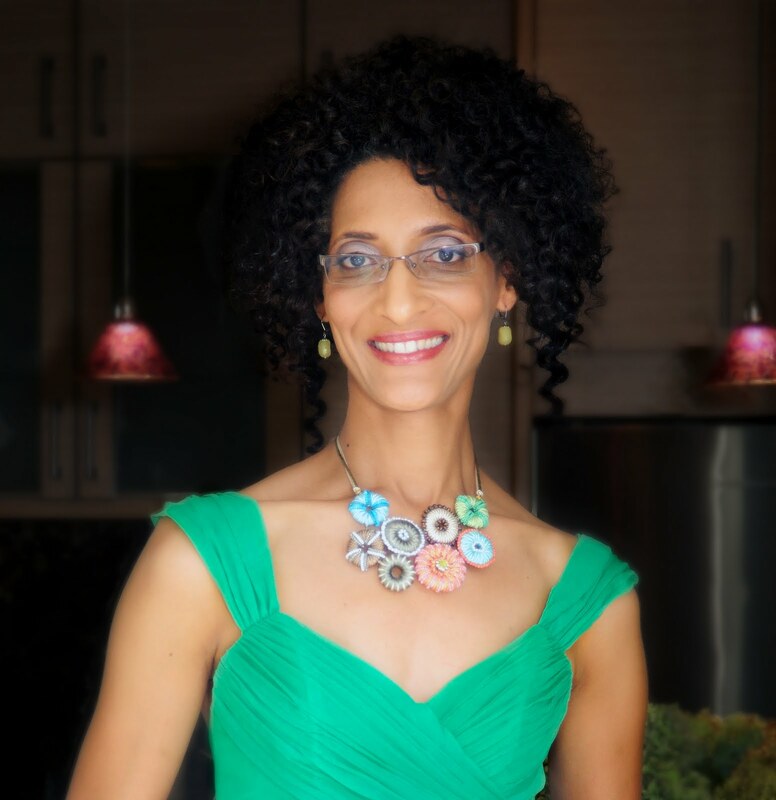 Carla Hall first won the hearts of fans nationwide on Bravo’s Top Chef, then won Fan Favorite on Top Chef All-Stars. In Cooking With Love, she serves up more than 100 fantastic recipes for food that hugs you. With her signature tasty twists on tried-and-true classics, comfort food never tasted so good! From Down-Home Deviled Eggs with Smoky Bacon to silky and light Spicy Carrot-Ginger Soup to the ultimate Chicken Pot Pie with buttery crust on the bottom to her Granny’s unforgettably luscious Five-Flavor Pound Cake, Carla’s flavorful recipes are so deeply satisfy­ing, they’ll become family favorites in your kitchen. 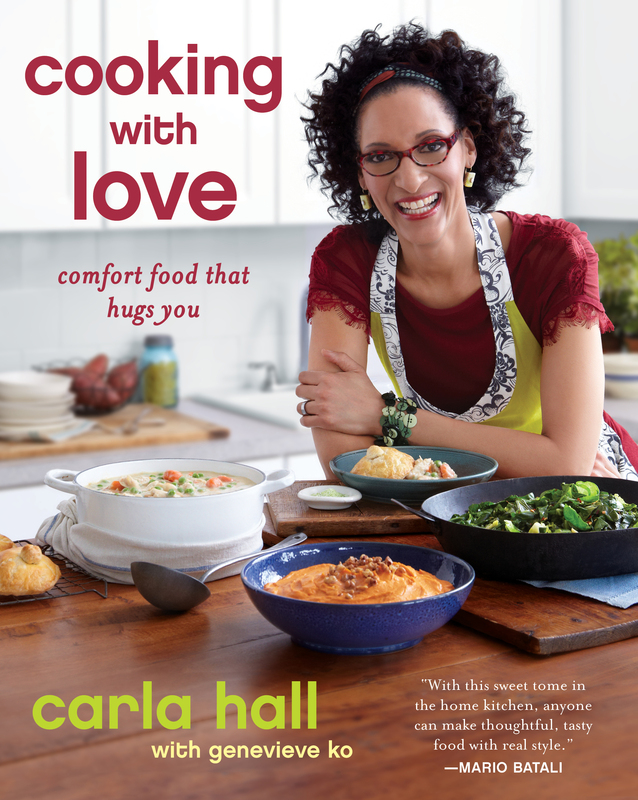 For Carla, the only way to make truly comforting food is to cook it from the heart, and in Cooking with Love, she shows you that love with her tempting, inspiring recipes for all sorts of sumptuous dishes, displayed in beautiful full-color photographs. Carla also tells funny, poignant tales of her own life cooking with family, friends, and fellow chefs. Hootie hoo! Welcome to my very first cookbook. I’ve been a chef, a caterer, a lunch lady, a dancer, a runway model, a reality show star, a daytime cooking show host, even an accountant (really! )—and now I’m a cookbook author. But most of all, I’m a simple Southern girl who loves to cook and who cooks to love. What you’ve seen on The Chew and Top Chef isn’t a gimmick, or an act, or something that ends when the dishes are cleared. That’s who I am and what I cook. Food that hugs you. What could be better than that? Now, giving a hug is easy, but making food that hugs requires a little bit of practice, but it’s actually easier than most people think—and so much more fun! Whether you’re starting to cook for the first time or you’ve been in the kitchen forever, I’m here to give you the techniques, the recipes, and the confidence you need to cook with love. As you’ll see, my food comes from all over the place. I draw as much comfort from Italian flavors as I do from Japanese ones. But at the end of the day, much of my inspiration comes from the American South. I grew up in Nashville, Tennessee, home of the Grand Ole Opry and the Titans. But my grandmother’s house is my favorite spot in town. Every week of my childhood, I was smothered with a giant food hug at my Granny’s Sunday supper. I can’t say that I learned how to cook at Granny’s side, though. Most of the time when we went to her house for a family meal after church, the closest I came to cooking was making mud pies. I’ve learned a lot since then: the difference between greens and weeds, the fact that, of course, Granny knew which was which and cooked only the collards, and how much the memories from our Sunday suppers have defined me. Granny’s weekly ritual started long before I came around. She was born Freddie Mae Price to Jessie, who came from a family that was spread across South and North Carolina, Georgia, Mississippi, and Tennessee. Jessie had been bought as a slave by the Price family and was among the last to be freed. In her 102 years on this earth, she lived to see generations of change in the South. She also passed on to Granny the depth and breadth of great Southern black cuisine. I wish every person in America could have sat at Granny’s table and been transformed by her cooking, warmth, and hospitality. I’m writing this book to honor Granny—and the women who came before her—and to give you a taste of just how much joy can be had in the kitchen and at the table. I’m even giving you some of Granny’s treasured recipes, like her buttery pound cake and juicy smothered pork chops, and passing on my interpretations of soul food. Sure, I cook my collard greens low and slow, but guess what? I also sauté them quickly and top them with gremolata, an Italian parsley-lemon-garlic mix. And I do a mean French bouillabaisse sauce of fennel and tomatoes to serve with a roasted whole snapper. Yep, I do all that. I’ve been cooking professionally for years (and I mean years!) and travelling and eating around the world. I’ve discovered that I can draw comfort from all types of cuisines. Here I’ve created a collection of my all-time favorites. Sort of an “all you’ll ever need” repertoire of global comfort food. Because it’s not the geographic origins of the food that matters, it’s the heart you put into it. And the book is about making comfort food good for your heart, too. I never count calories or sacrifice flavor. Instead, I boost flavors by using just the right amount of butter (which I love!) and the ideal cooking technique. I say “no” to nothing. It’s all about moderation. For example, I always make sure that both my pan and the oil are hot enough when cooking cornmeal-crusted Southern fried catfish. That way, the cornmeal doesn’t soak up the oil, it just gets super crisp in it. My dishes end up being naturally nutritious. My goal is to create the most delicious, comforting dishes possible, but I’m also always thinking of ways to lighten ultrarich soul food classics and other soulful hearty favorites. It’s a way of bringing out the fresh, natural flavors in great ingredients, but my motivation hits closer to home. While living abroad, I received a call and found out that my mama was seriously ill. I flew home right away and was relieved to find that her emergency surgery had been a success. Since that experience, I’m constantly tinkering with dishes to make them lighter, healthier for Mama. Even when I started my first “professional” cooking company, delivering lunches using a retired mail truck and sheer grit in getting my food out through rain, sleet, and snow, I was providing options far superior to the surrounding fast foods, both in flavor and nutrition. With my company, The Lunch Basket (which I later renamed The Lunch Bunch), I became the lunch lady of Kennedy Street in Washington, D.C., a primarily African American neighborhood with lots of beauty salons, barber shops, florists, and doctors’ offices. Even though I didn’t realize it at the time, my decision then to not use beef or pork (though some of my recipes here do) came from a desire to show people how tasty food could be without those things. I stuffed my biscuits with lean smoked turkey and put together fresh green salads, seasonal fruit, and rich veggie soups. At the end of the day, I’m giving you delicious fresh food—whole ingredients, lovingly prepared. I’m making dishes good for my family, in every sense of the word, and I’m here to help you do the same for your family and friends, too. The act of cooking for and feeding loved ones yummy wholesome food is deeply fulfilling. I didn’t completely understand that until I was an adult well into my food career. I went through a heart-wrenching breakup (boyfriend left me for best friend—you know the story), so I poured myself into my lunch business to shield myself from the pain. By cooking for others, I was nurturing them with food, and in turn, felt nurtured myself. I expanded the lunch business into a catering company and called it Alchemy Caterers, because I needed it to change my life, to turn the lead in my hurt into gold. I wanted my food to do the same for others and be a conduit for healing. I don’t know exactly what you need right now, but I do know that there’s comfort in food. Alchemy is all about transformation, and I want to change the way you experience food by cooking with love. The only way you can make transformative food, even if it’s one of the simple dishes in here, is to cook it from the heart. You have to want to do it. If you’re not in a good mood and don’t feel like cooking, the only thing you should make is a restaurant reservation. And you can’t cook with fear. I didn’t grow up in the kitchen and I know how it feels to be intimidated by a recipe and be immobilized by that fear. I’m here to tell you it’s okay to mess up! I’ll help you avoid screwing up and tell you what to do in case something does go wrong. Now, it’s time to have fun! I’m going to make sure you enjoy cooking for family and friends by sharing easy entertaining tricks I’ve learned from decades of catering. When you’re armed with tips from a pro, cooking with and for friends is the best way to have fun in the kitchen. One of the happiest moments in my life—my wedding day—came from doing just that. My husband, Matthew, and I celebrated our marriage with forty friends and family and a group of us prepared the food together. I didn’t stress over the planning or micromanage the meal. I just let everybody express themselves in the kitchen and it was awesome. I felt like I was on top of the world and I honestly can’t imagine a more memorable wedding day. But take my advice as a former caterer: Please don’t try this if you have hundreds of guests celebrating with you. LOL. So, are you ready? With all my yummy recipes and tips, get excited to welcome friends and family over for big meals and good times! A little note: Any brand names of products I use in this book are included just because I like them! "Whoever put this book in your hands loves you - and you're about to love them right back! Carla is a born teacher. Full of useful insights, helpful quick-fixes learned from years of trial and error, and her signature humor (and patience), Cooking With Love puts Ms. Hootie Hoo herself right there at the stove next to you, every step of the way. Whether you're a novice or expert, she'll have you dancing into the kitchen to whip up unbelievably simple, sumptuous feasts from scratch, whether it's weeknight Buffalo Wing Burgers, or The Saints' Gumbo for a weekend get together. If I'm coming to dinner, please make the Groundnut Stew - it's my favorite!"